Your hectic workload keeps you too busy until you have forgotten your girlfriend’s parent are coming to visit you this afternoon. Your clothes are still in the bin while the floor has not been swept for weeks. If this always happens to you, perhaps a little investment in the vacuum cleaner robot, CW 100 by the South Korea’s mobile operator KTF is worth looking at. Controlled remotely via a 3G mobile phone, the KTF’s vacuum cleaner robot CW100 will do the tidying job for you even though you are miles away. The cleaner robot features an onboard video camera which can send live images to users’ 3G mobile phone. 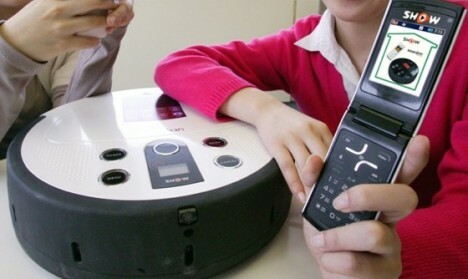 Users can see via the robot cleaner’s camera and control the robot’s action using the phone’s keypad. This is what is meant by technology doing our dirty work for us! The CRW-100 robot cleaner is priced at KRW 500,000 (about $370) together with a 3G data plan for KRW 5,000 (about $3.70) per month. This whole package only works for mobile phones that support 3G video calls.